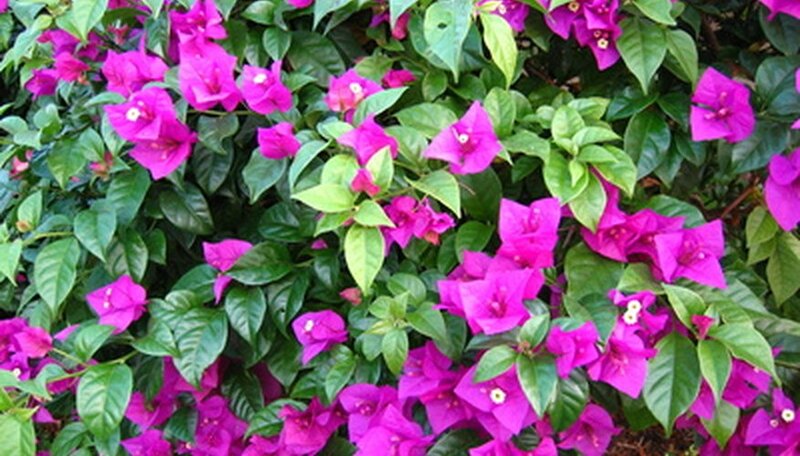 Bougainvillea is a thorny South American creeper that is widely cultivated for its showy flowers. These are in fact bracts or modified leaves surrounding a small tubular flower. While naturally a climbing plant up to 60 feet long, you can train the bougainvillea into a free standing shrub and even grow it in containers as a house plant. Bougainvilleas are largely disease-resistant but can suffer from fungal and bacterial attack, especially when grown in damp conditions. Sooty mold appears as a fine coating of grey or black soot-like powder on leaves and stems. It is often a consequence of aphid, white fly or scale insect infestation. The bugs produce a sweet substance, which coats the surface of the leaves and stems and allows black mold to grow on them. Treating the bugs with an insecticide or insecticidal soap will remove them from the plant and eliminate the food source for the mold. Be sure to identify them and are not killing beneficial insects. Remove early, light mold by spraying the plant with a cold water. Bougainvilleas are prone to root rot caused by overwatering. The root system is delicate and will rapidly die off if surrounded by water-logged soil. Symptoms of root rot include wilting when the soil is wet, dieback and chlorotic foliage caused by a lack or nutrient absorption. Make sure that potted bougainvilleas are allowed to drain completely after watering and cultivate outdoor plants in freely draining soil. Leaf spot in bougainvillea is due to the bacteria Pseudomonas andropogonis and is more common on plants grown in damp areas or watered from above. It manifests as small reddish spots on young leaves, which grow larger and develop into large tan blotches with a reddish rim. In severe cases whole branches are covered in disfigured leaves, which eventually drop off. Leaf spot spreads because of splashes of water and contact with infected plants. Treatment consists of pruning away infected sections of the plant and reducing any overhead watering. Fungal leaf spot looks very similar to bacterial leaf spot. It is due to excessively damp conditions, and treated by reducing watering and stopping any water spray from wetting the leaves. In a collection or garden, prune infected plants back to prevent the infection from spreading and dispose of all cuttings. Bougainvilleas often suffer from nutrient deficiency, which turns the leaves yellowish, and treat with a fertilizer containing micronutients or a foliar spray. Several insects will eat bougainvillea leaves, especially the caterpillars of the bougainvillea looper Disclisioprocta stellata. Scalloping of the leaf edges and irregular leaf damage are signs of insect attack. Treat by manually picking off the pests or with an insecticide or insecticidal soap.